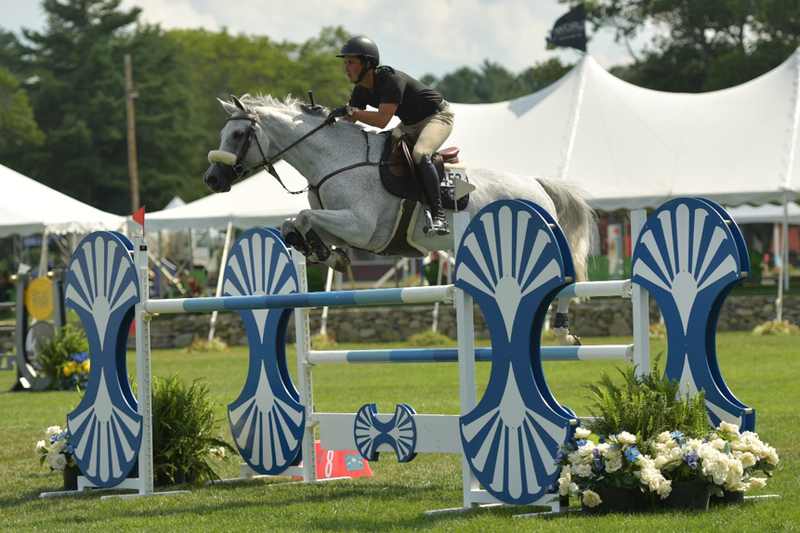 Nick Dello Joio cruises over a blue-and-white oxer onboard his winning mount, Contiki. Halifax, Mass. 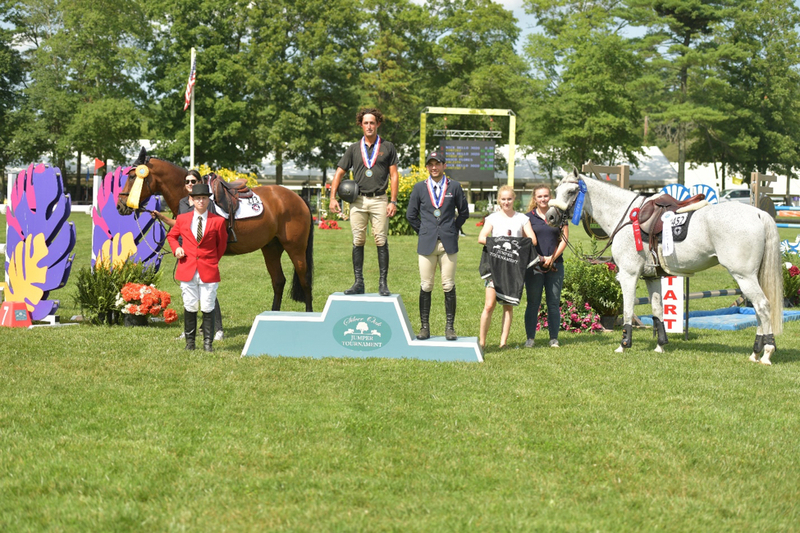 – Aug. 16, 2017 – Nick Dello Joio and his 11-year-old gray gelding, Contiki, clinched the Open Jumper 1.40-meter sponsored by Lumber Liquidators on the Grand Prix Field during the opening day of the Silver Oak Jumper Tournament held at the expansive Fieldstone Show Park in Halifax, Massachusetts. 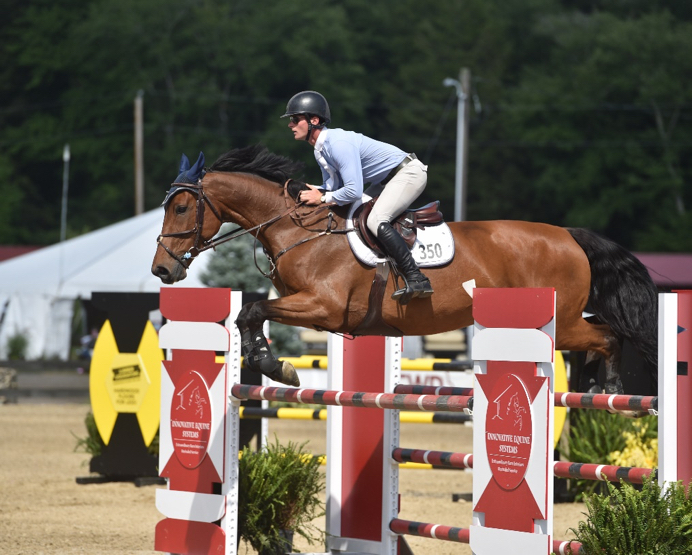 Dello Joio kicked off the day by capturing the Open Jumper 1.30m, sponsored by Hubbard Horses, aboard Armaged’ick. Dello Joio was one of more than 500 exhibitors who gathered amid clear skies and sunshine at the venue. This year’s Silver Oak Jumper Tournament was at sold-out status a week ago – a testament to the dedicated staff who knows the value of managing the experience and expectations of top riders who return to the show each year. Dello Joio earned first place aboard Contiki and second place on Virgo DC; Vasco Flores came in third with his mount, Calista. Photo by Andrew Ryback Photography. 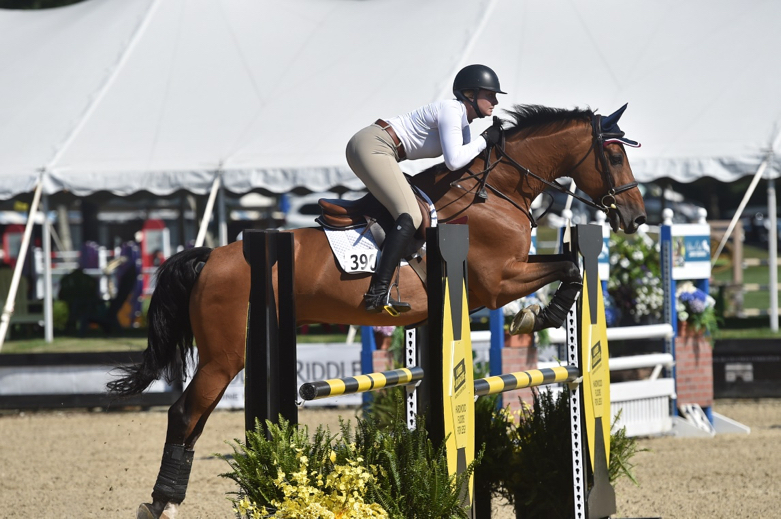 The CMJ Annex Ring, adjacent to the Grand Prix Field, afforded a host of horse-and-rider combinations the chance to experience schooling and developing jumper classes in preparation for the more challenging classes later in the week. 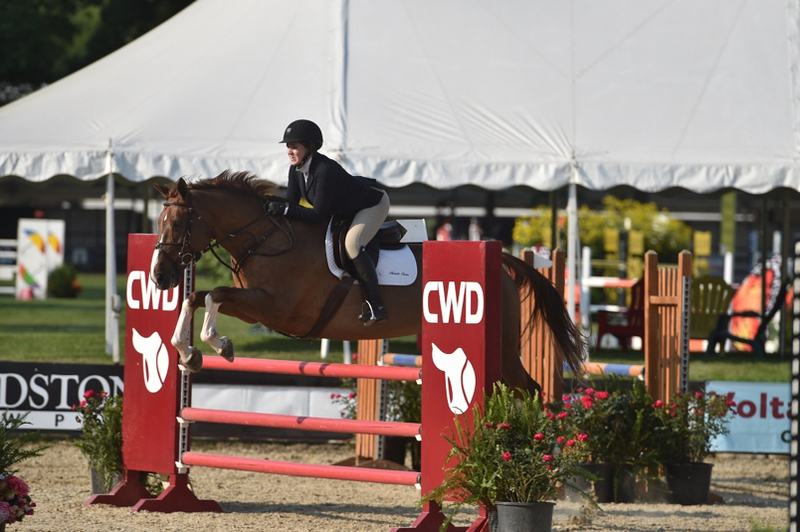 In addition, an Open Jumper class and two Low Children’s and Adult Classes were held in the afternoon. A perk of participating in the show is the chance to claim one of McLain Ward’s championship coolers in the Silver Oak Jumper Tournament’s silent auction to benefit Omega Horse Rescue. Ward generously donated the coolers to raise awareness and much-needed funds for the rescue. Bidding is open in the Rider’s Lounge until Friday, Aug. 18 at 7 p.m., when the highest bidders will be awarded a show jumping collectable. Ward earned one of the coveted coolers after he won the $200,000 Budweiser American Invitational aboard his famous two-time Olympic Team Gold-medal winning horse, Sapphire, in 2008 in Tampa, Florida. This event no longer takes place and the distinct red, green and yellow colors emblazoned with the Budweiser logo make this cooler a true collector’s item. 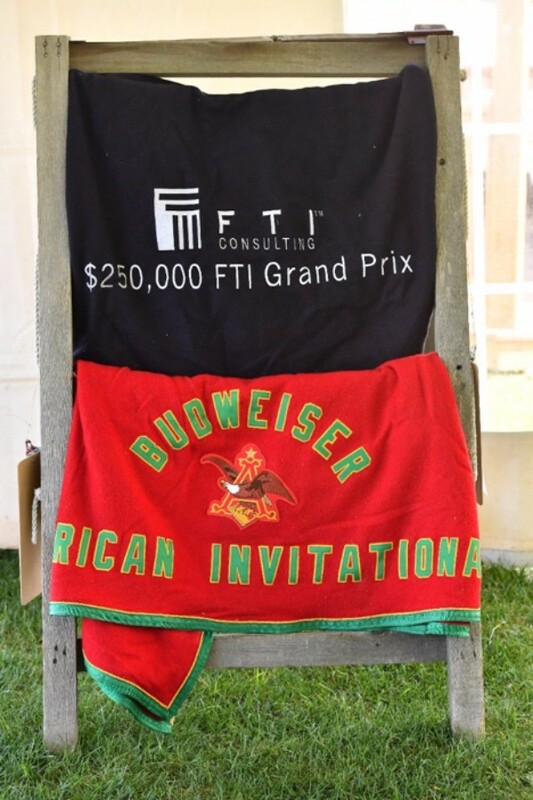 Another cooler is from the 2010 Hampton Classic Horse Show’s $250,000 FTI Grand Prix and FEI World Cup Qualifier when Ward repeated history onboard Sapphire to become only the third horse and rider combination to win back-to-back FTI Grand Prix competitions. Both coolers were made by Triple Crown. Aidan Killeen onboard Wyoming 195 won the Open Jumper 1.20m, sponsored by Stud Tree. sponsored by Rising Star Farm. Photo by Andrew Ryback Photography. All photos are by the official show photographer Andrew Ryback Photographyand are available for purchase in his mobile unit at Silver Oak Jumper Tournament.